There are a number of well-regarded authors who urge young writers to skip hiring agents and secure themselves entertainment lawyers. The reasoning is often, "Why pay anyone fifteen percent," and this sounds to me like the advice of the privileged. While I agree that if one had a relationship with an editor then there may not be a need for an agent, I imagine there are advantages to having an agent that could not be "replaced" by a lawyer, not least of which is genuine support (vague, I know, but you can't expect a fella to write coddling, can ya?). Do you have any thoughts on this? Are there more practical advantages to having an agent as opposed to a lawyer going to "war" for you? Thank you. Enjoy the blog a good deal. Do you like the new name? It is what you can expect if you remain nice. This is the most idiotic advice I've seen since "ignore the SASE request". First, an entertainment lawyer charges you by the hour. $375 an hour is what they charge here. Every hour you talk to them. Every time you talk to them. Every time you email them. Now, I don't know what those boneheads who offered that advice do when they need any of the myriad things agents do that lawyers do not. All I know is that if I could get $375 an hour for soothing a client's fears about 14 rejections, the proposed change to a book title, weighing the merits of five different titles, getting reviews posted on Amazon and first serial rights, I'd make a lot more money than I do right now. And that's not even counting all the stuff I do that doesn't involve the client: selling the book, negotiating the deal points, staving off the crazed editor who is rejecting the second book, reading the damn manuscript for typos three time. Hell, I'm going to start charging you for reading this blog. Pony up. Having a relationship with an editor is no reason not to have an agent. In fact, I have a good relationship with an editor. We had coffee last time I was in the 212. And do you know what she said to me? 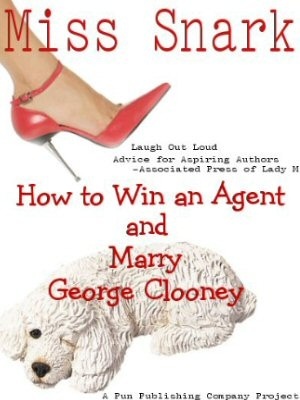 She said, and I quote, "If you want to be taken seriously in this business you need an agent." She was talking about in YA where it's not required and you can still submit directly to publishers. Either you're a pro or you're not. And now a lot of people who don't have agents and have negotiated their contracts themselves will say I'm an idiot, but you know what? Who cares? Everyone I know who has an agent gets bigger advances, smaller headaches, and gets to write instead of query. If you are getting six figure advances and every publisher in New York is waiting to bid on your next tome - then just an entertainment lawyer MIGHT make sense. To me, the questions are, (1)"How much do you want to do yourself? ", and (2) "How much do you trust yourself that you really know?" I figure, if I do the study one time on the market, then one time on the agents, I can partner with an agent (with fully loaded cluegun) who can save me most of the effort thereafter of keeping up with the markets. So either I can write and promote myself and learn the market each 33% of the time, or I can write and promote each 50% and learn only as assigned by incoming agent clue bombs. I calculate that as me writing about 50% more, but targetted more accurately, for 15% of my income. I'll do that deal all week and twice on Sundays. Especially since a good agent will probably add more than 15% to the points on the contract, and cut the delay in sale by more than 15%. My agent is worth every cent of the 15%. Hell, I'd probably pay her more. Lawyers can be counted on to offer "genuine support" (more so than agents)? Did I read that correctly? I'm a lawyer, and THAT was my beverage alert du jour. Okay, M.S. coffee and soda are one thing but I just lost half a glass of my very favorite wine (Ironstone Symphony) spraying it far and wide on my desk. Back before I had an agent, I paid a reputable contract lawyer $100/hour to look at my story. Worth the peace of mind of knowing I wasn't doing anything stupid, and her advice resulted in a few positive changes to the contract and its terms, too. Frankly, I think anyone who thinks they can negotiate their own contract hasn't been reading Kristen Nelson's blog lately. And in regards to a lawyer, some of the stuff she points out is stuff that only someone who CARES is going to find and fight for you. I admit, Miss Snark had a lovely comeback. But I have to toat the original poster here - Nice Miss Snarkles, indeed! Average first novel TERRIFIC advance is $10,000, which means that you'd pay an agent $1500. to have her hold your hand all the way through the process. At that $375. rate, that buys you four hours. Four. And lawyers do bill for phone calls, research, etc. They don't nickle and dime you to death, they work in $15. chunks. Not to mention expenses. Hello. Have you seen what it costs to have a lawyer photocopy or mail something to you? Poster is correct. If you've been around a while and know how to maneuver your way through the publishing world, and you're making a seven figure advance, maybe a lawyer is better. But for a new writer? What planet are these people from? I can imagine an entertainment attorney who takes on an unknown, not-previously published author and does a superb job with marketing and placement, then turns around and does a superb job turning that potential business transaction into a real one. I just don't know any who do so regularly without delegating one or the other aspect to someone else. Agents and lawyers have different skill sets and fill different, contradictory roles. An agent gets a book in front of someone ready to purchase it. She spends her time, expertise, etc. on marketing and placement. A lawyer shapes a possible transaction, from both advisability to terms. He spends his time, expertise, etc. on turning a semihandshake-sort-of-agreement into a working business transaction. "Hell, I'm going to start charging you for reading this blog. Pony up." Two million hits! It'a about time! Yes, this is an odd one. I am an entertainment lawyer and work a lot in publishing with both authors and publishers, and I can negotiate a great deal and provide plently of support. But in terms of actually selling the book? I encourage people I work with to have agents; that's what they do. Some authors can do it themselves, sure, but those are the writers with the marketing/sales person gene. They act as the salesperson for the book and I provide the back-up. But even with my contacts and experience selling a book is not in my skill-set, and, as noted, it would cost you too much. Get an agent if you possibly can. They ARE coming for you! Killer Yapp - Guardian Angel! Feeling foolish about your new computer? You bought that new washable keyboard...right?